The Hammer Heads Program is a twelve week skill and employment-based training program that links young men and women from under-resourced communities to apprenticeship career opportunities in the construction industry that they might otherwise have difficulty accessing. Participants are exposed to multiple construction trades over the course of the program. There is hands-on learning at various affiliate training centres located across the GTA in addition to jobsite visits. Participants are provided with leadership and mentoring from seasoned construction workers with years of work experience and learn valuable skill sets which build self-confidence and promote positive self-awareness. Hammer Heads can link youth to twenty-eight different unions and the many major contractors connected to the Central Ontario Building Trades. "The Hammer Heads Program changed everything for me. Now I know the direction I want to go in. My communication skills have improved dramatically. I learned the importance of a work ethic and that your reputation on the job is very important." "Hammer Heads has provided me a start to my career and a great job. During the twelve weeks it helped me prepare for being successful in my job now by teaching me it is important to arrive on time, have a good attitude and ask questions when I don’t know what I’m doing. 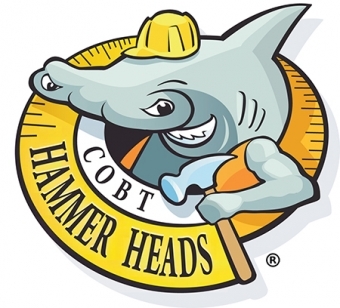 I feel confident at my job because of the safety training Hammer Heads taught me. It is nice to have a steady income and know that I’m going to be okay." "I can’t say enough about the Hammer Heads and how it changed my life. I’m gaining the self-confidence to know that I can do anything. I’m really proud of myself. The Hammer Heads Program provided me with all kinds of hands-on training and gave me the experience to start a career."